June is not over but there are some growing positive reports on the performance of managed futures during the BREXIT event. The dispersion of returns exploded over the last few days but the general direction has been significantly up after giving back earlier gains. We track a set of liquid managed futures funds, currently fifteen, as a way to measure intra-month performance. This portfolio includes the largest and most well-known as well as some managed futures multi-manger funds. We think there are advantages with seeing the dispersion of returns across managers and not just the median. 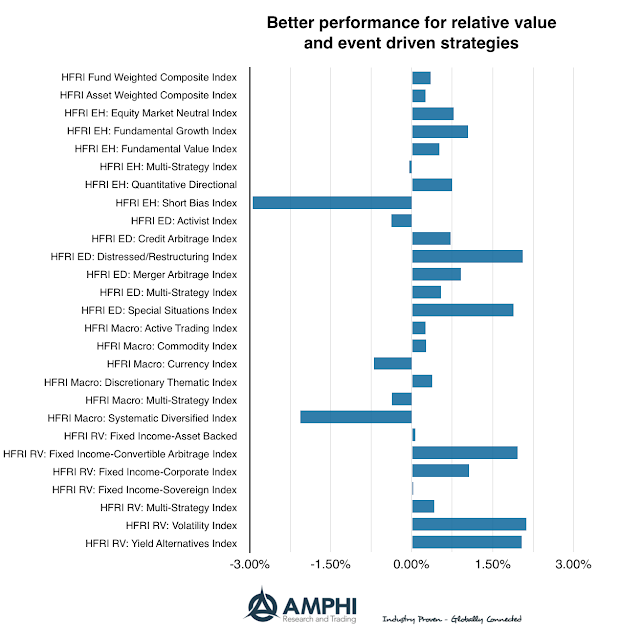 The first graph shows the high, low, and median fund performance while the second shows the daily NAV's for each fund for the month of June through yesterday. 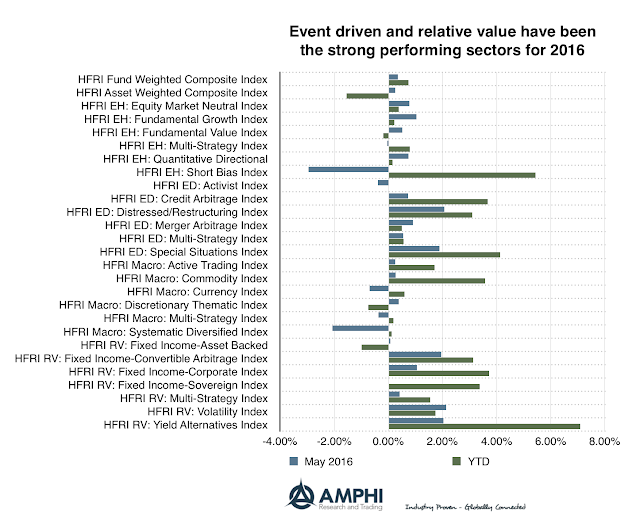 What is most interesting about the intra-month performance is that it was significantly up by mid month during the period of market uncertainty only to see almost all of the gains given back just before the BREXIT event. This was the period when equity markets gained under view that the remain vote was likely to prevail. 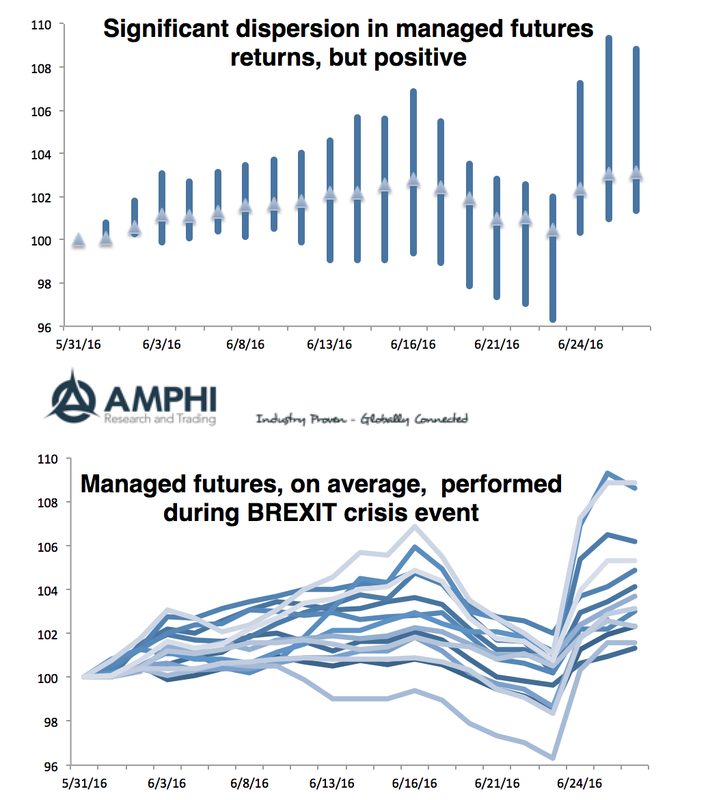 Upon the BREXIT vote announcement, managed futures fund performance exploded on the upside. 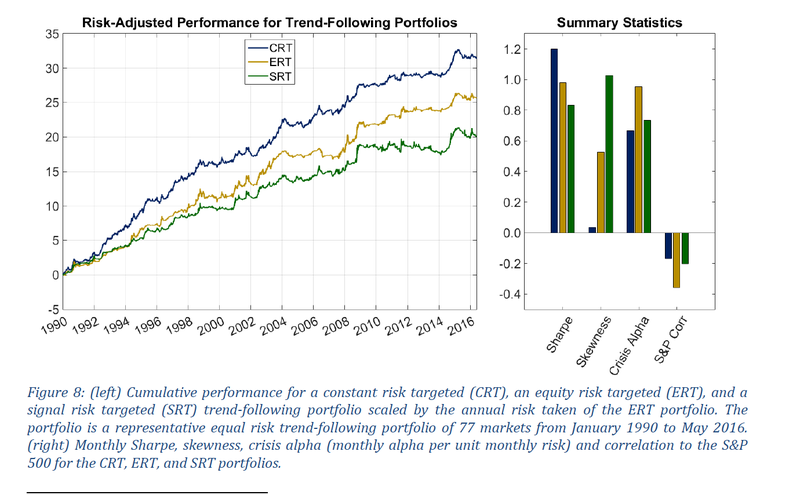 This return profile suggests that managers had significant long fixed income and "safe" currency exposure and were either light or able to cover losing global equity positions quickly. Nevertheless, a review of the return dispersion suggests that all managed futures managers are not alike. There were clear winners and others who needed to dig out of performance holes. Most of the managers followed in our tracking portfolio are trend-followers. Many would like to say these managers were insightful market traders, but in fact, trend-followers are signal extractors from market prices. There may not have been any special insights other than being long markets trending up and short those going down with sizing related to market volatility. In reality, their distinct advantage is not trying to over-think the market but follow the direction of market sentiment embedded in prices. They are able to profit from divergent prices because they focus on those price events. As regularly said, prices are primal and should be the basis for core decision-making. BREXIT and uncertainty - Could a EU policy of punishment toward the UK go too far? The uncertainty surrounding BREXIT has not been resolved and will not be resolved for some time. In fact, as the full extent of this event starts to be realized, the financial impact may increase. Joining the EU was like going to the Eagle's Hotel California. You cannot leave, or at the least, a country that wants to leave will be severely punished. The reasoned strategy for the EU is to make the terms of a UK exit so high that others will think twice of voting for exit. Punishment seems to be the policy of the day in order to protect this more perfect union. It sends a clear signal to other EU members. I am not sure this was the intent of "one Europe" but this is the place where we are currently. I am thinking right now of the punishment of Germany after WWI with reparations and the thoughts of Keynes in The Economic Consequences of the Peace. Is it possible that asking for a quick but painful solution for trying to save the EU could lay the foundation for the next large recession? Could an attempt to reach a higher goal cause greater harm for the European community? While extracting punishment for leaving is rational, can it go too far? 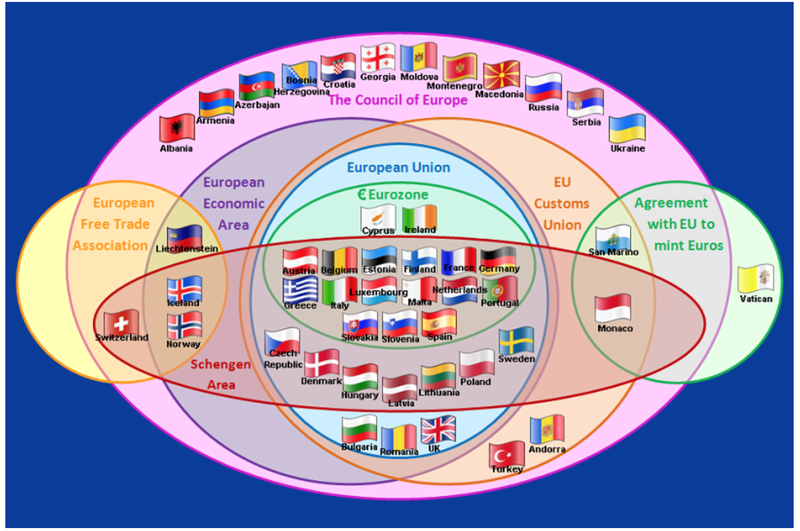 The Venn diagram below shows the different forms of connection across Europe. 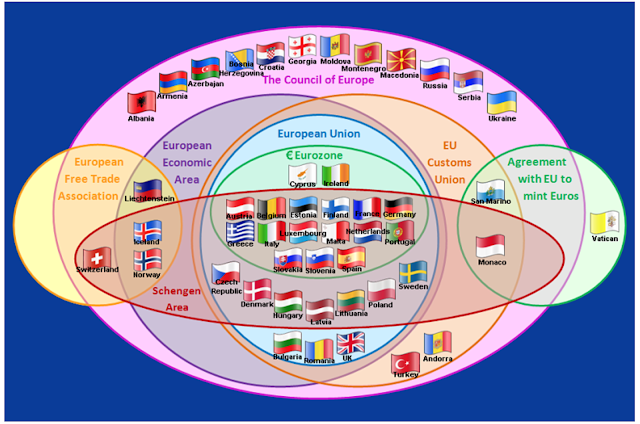 There is the EU custom unions and European Economic Area EEA that can both be used to find a middle ground for compromise. It is still early to tell whether these can be fit for the UK and the EU. Our job is to handicap markets not to provide solutions, but we have to think through the implications of policy actions and whether they may create more downside risks as well as upside potential. Our concern is still skewed to the downside. Investors make mistakes. They will have biases. These biases may have contributed to the market sell-off on Friday. 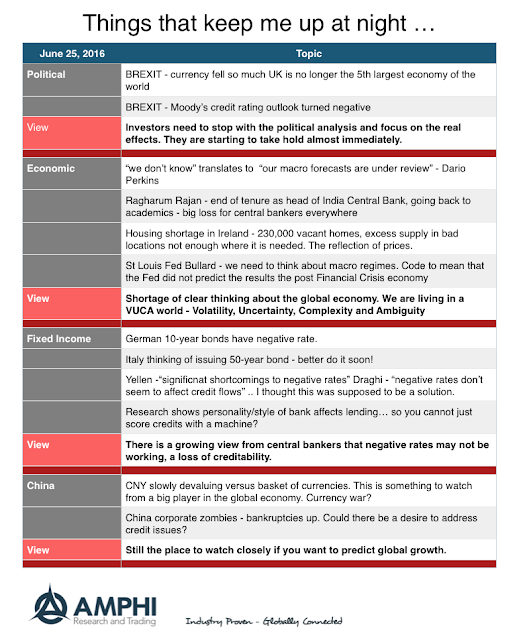 I am looking at the reasons for why the financial community was so wrong about BREXIT. The tight poll number suggest that hedging or reducing risk exposure would have been a prudent strategy, yet the negative market reaction was swift and large and in the opposite direction of the markets from the previous few days.The markets were caught by surprise. I believe in part there were some behavioral bias at work. For Londoners in the finance community, there was a bias from agreeing with all those around you who have the same opinion. The areas outside London are like different regions. 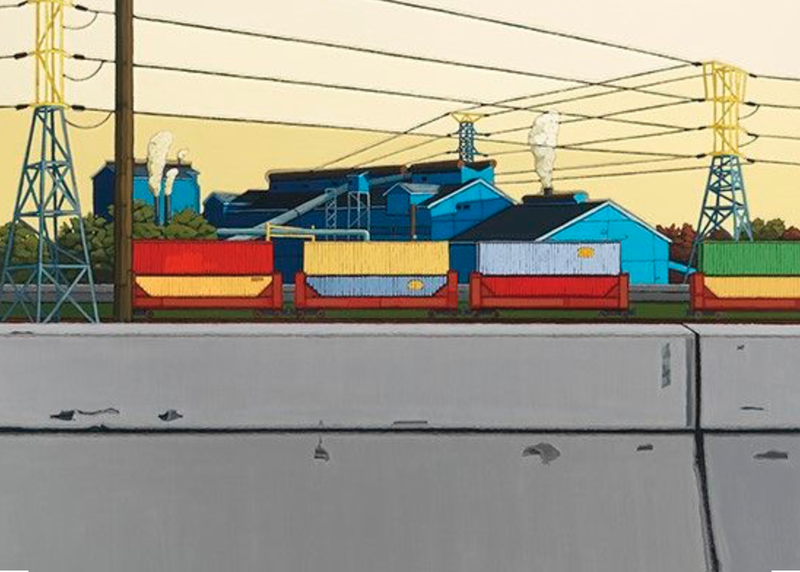 The finance community has an information asymmetry because they are not in touch with those outside of the city. If they in fact acknowledge that there is a different opinion, there is the view that it is obviously wrong. If everyone around you agrees with your thinking, you may fall for the idea that your circle of friends represents the greater view, a false consensus. This is consistent with an in-group bias where we want to believe the views of those in our tribe or circle. Granted the polls showed a close vote, but the bias for many was thinking that this could never occur given their group or home base is thinking this would be such a bad idea. 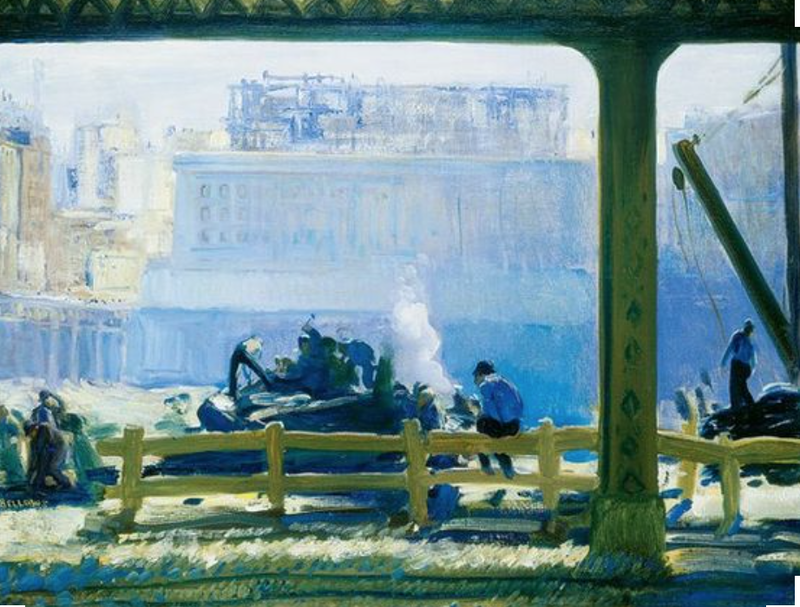 Researchers have found a "home bias" with portfolio allocations. One of the explanations for the home bias is that there is information immobility or asymmetry. Even if capital is mobile, if there are large information differences or views across names, there will be less diversification. Investors will not change when there circle of information or opinions is consistent with their current allocations. They will anchor with the things they know. When the surprise comes, it will be big. Of course, this was an event that was uncertain and could not have been properly handicapped in spite of the all of the polls. There may not be a behavior bias with being wrong on a highly uncertain event. The complexity of the issue made any judgment on how citizens would vote ambiguous. 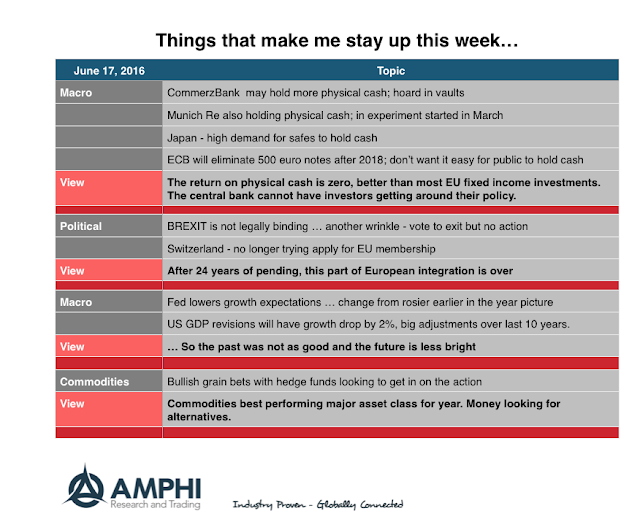 Unfortunately, if investors were truly facing an uncertain event, holding cash or hedging would have been the trade before the event. So why was the market positioned differently? Many managers are going to require some deep introspection on how they positioned themselves for this trade. All eyes were on the BREXIT vote and the fall-out on Friday. It was a big event. The VIX index increased 24% in one day. The markets are likely to see further decreases in value and increases in volatility. The EU politicians seem to want to inflict pain on the UK as a signal to other countries. This strategy will not be helpful to markets. Nevertheless, there are other macro issues to worry about. 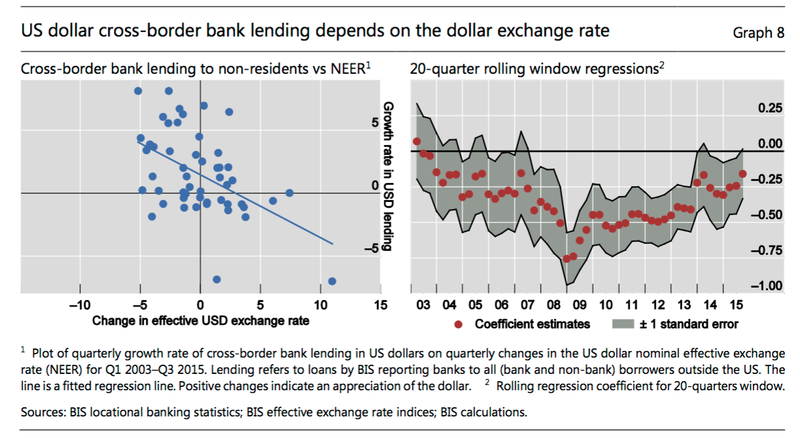 There is a growing realization that negative rates may not solve macro problems. This view is now being openly expressed by central bankers. 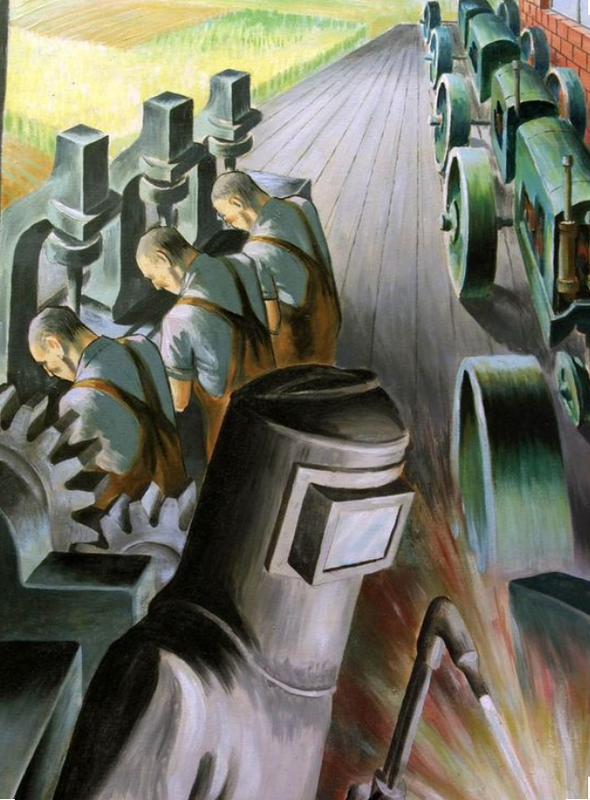 This means that the one tool that has been employed to boost growth is losing creditability. The vote on BREXIT caught many in the financial centers by surprise. I don't want to argue the merits of either side but to focus on why the surprise occurred. 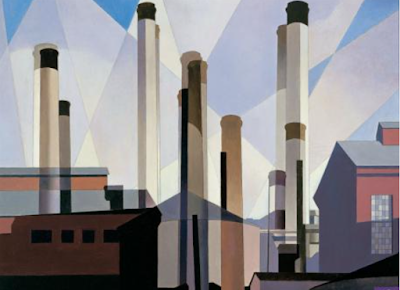 My thesis is that the city-states that represent the intelligentsia of the global service economy have a different view of the world than those that think in terms of a nation-state. The success of the global service economy which includes capital has surpassed trade in goods and commodities. The world view of those in these global service cities transcends the concept of nation and gives these citizens a different perspective from the rest of their country. This dichotomy has been going on for centuries but the special connectedness of the world is through city-states which place them at odds with rest of a country's population. It is not just any cities, but those that flourish under the global service economy of financial, consulting, media, entertainment and education that have a different view of immigration, globalism, and world order. The wide difference in vote between London and the rest of the UK is manifestation of the difference between the city and nation state. Cities at the crossroads of trade have always been the place for the mingling of culture, ideas, and people. It was natural that the citizens of the city were traders, artists, intellectuals, merchants, and those that wanted to hide from the oppression of rulers. City identities arose even before many of the current nation-states existed. The non-city-states, the rest of the nation, often looked askew at these cities as being at odds with the regional culture. We can go back in time with Athens, key cities in the Roman empire, the Italian trade centers in the Renaissance, the Netherlands, and London as key trade centers. Today, the true city-states of globalism include New York, London, Singapore, Dubai, Los Angeles, and Shanghai to name just a few. These cities do not have to be the biggest cities but rather those that have connectedness and reach around the global. They are the way stations of globalism. They are the centers of finance, so it should not be surprising that traders were caught off guard by the vote. Their world view and community is different. How could the vote to continue globalism fail when everyone around you is thinking the same? Managed futures has lost market share - whose fault is it? The premise for holding managed futures is that it is a true diversifying investment style. Managed futures will have a low correlation with traditional asset classes and it will have crisis alpha, the ability to have negative correlation during a market dislocation. Managed futures is able to deliver this low correlation and crisis alpha because it is divergent trading strategy whereby it makes money when markets have movement away from an equilibrium price. Trend-following has been characterized as being long volatility or long a straddle. It makes money when markets move to extremes. By any style description, it will be different than mean-reverting or convergent strategies that try to generate return in traditional asset classes through alpha generation with lower market beta. It is a different style. Yet, managed futures has been getting a smaller piece of the alternative investment allocation pie. After the Asian Crisis and Tech Bubble, allocations went from 20% to less than 10% of money invested in alternatives. Managed futures generated its crisis alpha and investors allocated to other strategies. The allocation percentage increased in 2008 but this may have been partially associated with better performance as opposed to investor allocations. Nonetheless, allocations moved up to 15% three years after the Financial Crisis only to fall again to approximately 10%. 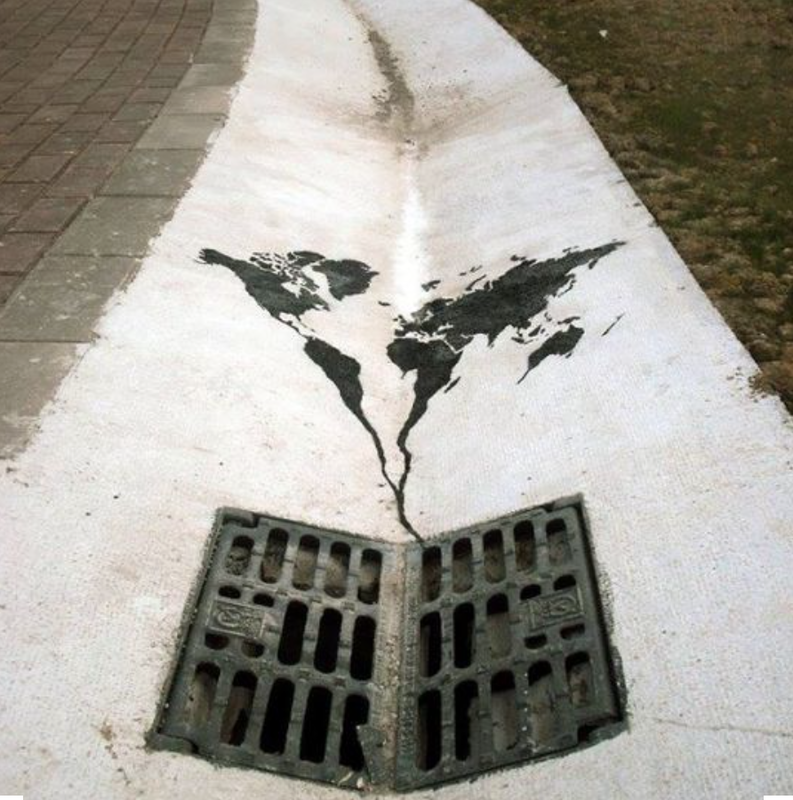 The vivid fear of a crisis increased allocations only to fall again as the crisis began a more distant memory. While investors ultimately are responsible for their allocation decisions, the burden is on the managed futures industry to tell a better story for why an allocation to a divergent strategy is needed. Any investment like managed futures that does better in "bad times" will have a lower risk premium and may underperform during normal times. I am not going to use an insurance argument that poor performance is a price that must be paid not different than a premium paid for protection, but the industry has to better articulate both crisis alpha and stand-alone or normal return expectations. It is the responsibility of managed futures managers to educate and manage expectations on performance and its diversification benefit. Investors do not seem to get the story, so the burden is on managers to craft a more effective message or rework their funds to deliver what investors want without throwing out their uniqueness. I have recently seen more work on the poor performance of multi-asset and global macro funds. The simple analysis states that these strategies have underperformed the 60/40 stock bond mix of a domestic equity index (SPY) and long Treasuries (TLT) and have not done their jobs. 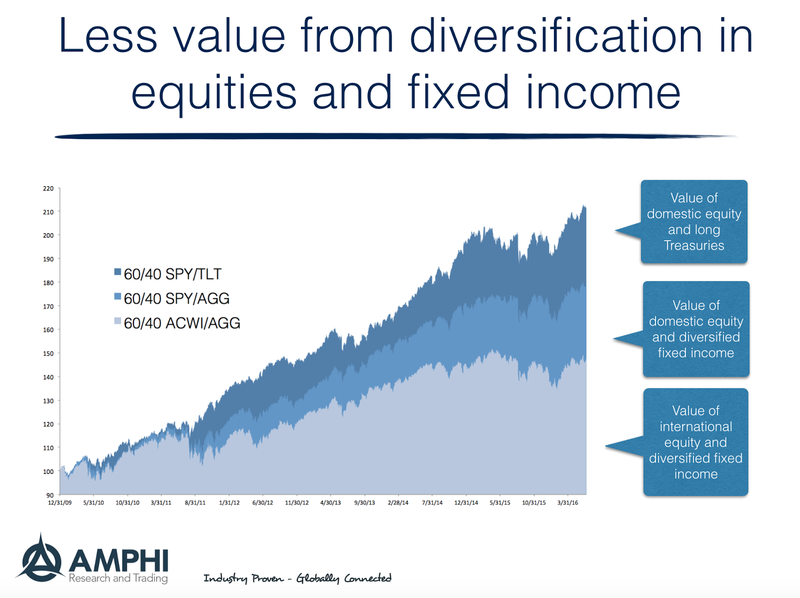 If you conduct a breakdown of the impact of diversification, you can see there has been a significant drag from trying to spread risk even within asset classes. You can hold the stock bond mix constant but still have a significant diversification drag. We have taken the simplest set of cases through comparing the 60/40 (SPY/TLT) mix with two simple diversification strategies. One, we substitute for the bond component the Barclays Aggregate index which holds corporates and mortgages and has a lower duration. Two, we switch the equity exposure to the MSCI world index (ACWI) which provides global stock diversification. Over the period from 2010 to the present, the impact is telling. 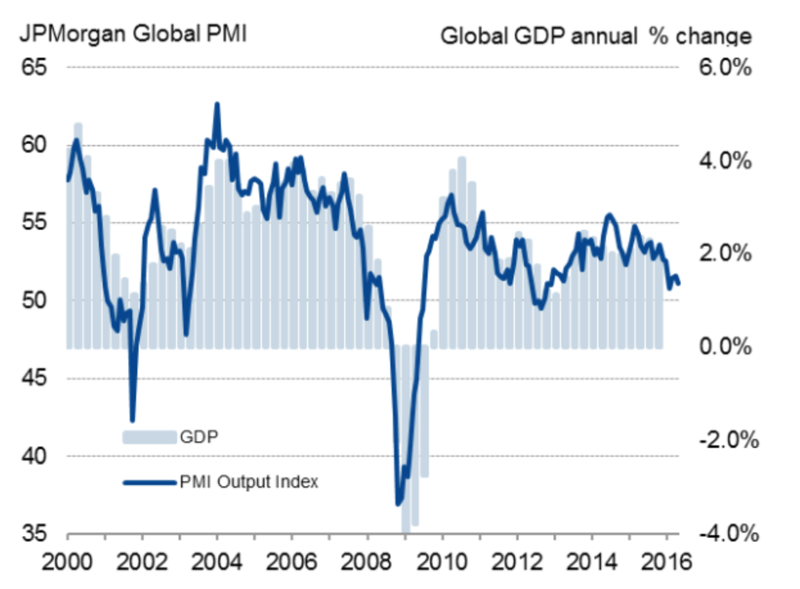 Global equities should reduce the exposure to the US business cycle but will increase exposure to non-US business cycles and currency changes. US stocks through their foreign operations are still exposed to the global business cycle and currencies, but the effect is muted. For fixed income, holding the Barclays Aggregate will reduce interest rate risk and should increase carry from credit spreads. Since 2010, having more duration and term premium exposure through holding TLT generated more return. Many global macro and multi-asset funds which start with the premise of holding a more diverse portfolio have seen a large performance drag versus the SPY/TLT mix. This drag had to be made up through security selection or dynamic changes in allocation. Maya were not able to generate the added return. It may not always be the case that there will be this drag, but all investors have to be aware of the cost of diversification. I just finished writing about strategy distinctiveness and hedge fund performance, (see Hedge Fund Strategy Distinctiveness Matters), which stated that there were gains from being different from the crowd when a new research piece on specialist firms crossed my desk. Specialists are investors who concentrate their portfolio bets. These are supposed to be the smart investors. I thought this would just reinforce the idea that those who have specialized knowledge will have more concentrated portfolios which will do better than the diversified funds. Unfortunately, the results of this new analysis are not what I was expecting. The author, Daniel Fricke, of "Are Specialists "Special"? 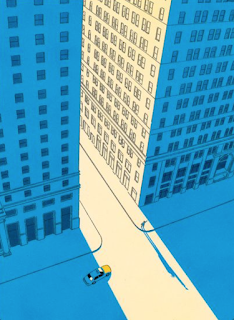 The Case of Institutional Investors" draws two conclusions from his analysis. First, there is a significant amount of overall with portfolios even by those who are specialists. Everyone concentrates on the same stocks. Second, the specialists who concentrate their portfolios do no better than those who are diversifiers. The hypotheses that those who have information advantage or skill will have more unique portfolios and generate extra returns is rejected. This is with a more general dataset and may not fully take advantage of the dynamic nature of trading, but it suggests that skill is hard to find. There are investors who think they are smart and unique but end up at the same place as diversifiers. 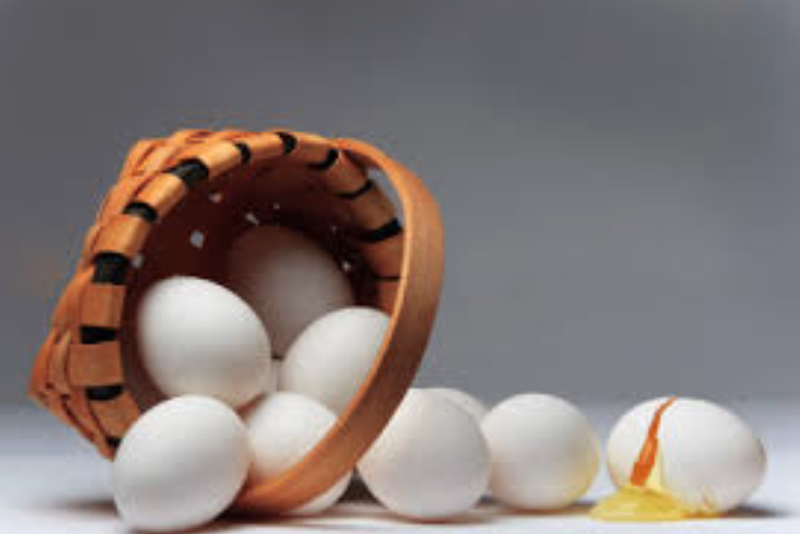 The investment theme of having a few eggs in your basket and watching them carefully does not seem to apply. An equity world of extremes - the need for active management? This is a very interesting chart on equity performance. Obviously, the histogram will be affected by the size of the buckets but it does not change the fact that there is significant performance action in the tails of the distribution. There will be big winners and big losers in the long-run. Passive management will generally not be able to take advantage of these extremes. Granted that market cap weighted indices will have grater weight to high performers over time, but market divergences will not be captured through passive management. One of the reasons for the effectiveness of momentum investing is the movement to extremes. 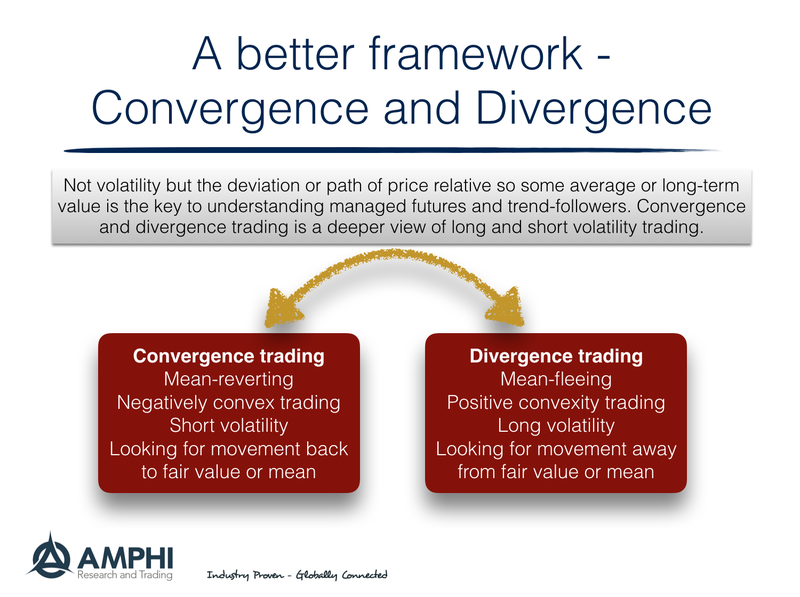 Divergences do occur. If you think that stocks will converge or mean-evert to some long-term market average you would not have fully participated in the equities that showed upside. Similarly, if you would have held onto stocks that continued to decline under the hope that they would mean-revert, you would have been gravely disappointed. Market dislocations are a key part of investing, so accepting market divergences will be helpful in the long-run. 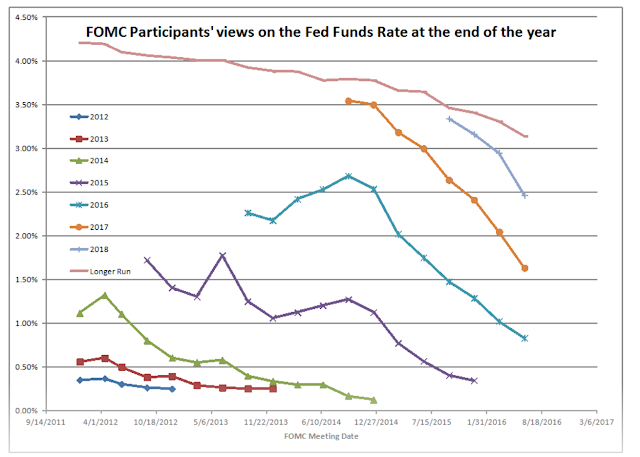 This FOMC "skill" provides an interest tale for investors to follow. There is the old adage, "Never fight the Fed." if you are an equity investor. We might be able to provide a new second adage, "Always fade the Fed's interest rate forecast." Hold your fixed income when the Fed cannot come close to getting interest rate forecasts correct. Perhaps the two go together, strong equities because the Fed will err on the side of caution with respect to raising rates. Nonetheless, these adages are interesting food for thought. This relationship will not last forever, but right now there is no evidence to suggest that there will be any improvement or change in the behavior of the Fed. The dot plots were supposed to provide some forward guidance on expectations, but they have turned into mis-guidance. 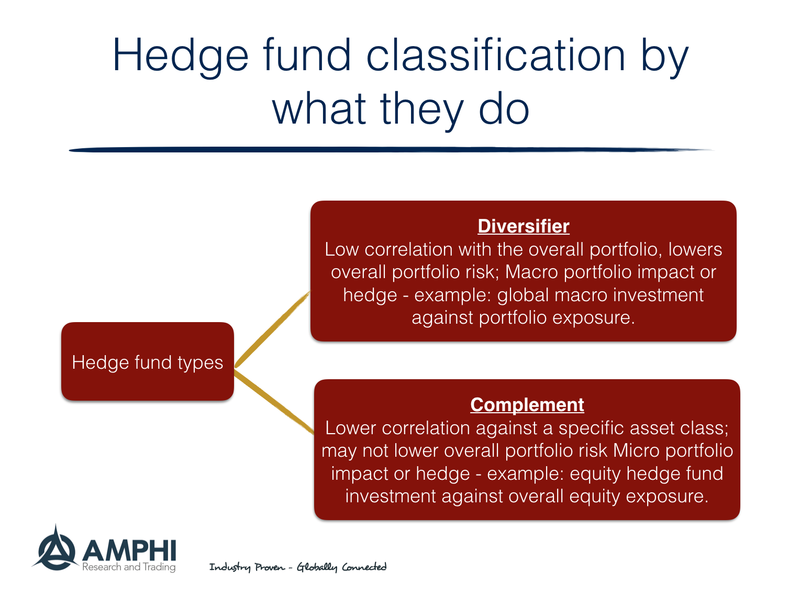 Diversifer or complement - What type of hedge fund do you want? There is an ongoing discussion of how to classify hedge funds. A simple approach can be divide hedge funds by their style whereby you can have equity long/short, convertible arbitrage, event risk, or global macro to name a few. But, from a portfolio perspective, there may be more important ways to classify alternatives based on what they can do for you. Call it classification in context. A recent Campbell and Co research piece "The Taming of the Skew" discusses how hedge fund can be classified as being either diversifiers or complements. A diversifier will be a hedge fund that will lower volatility based on its lower correlation with the overall portfolio. Its objective is to increase the long-term Sharpe ratio. The complement hedge fund will be one that provides value-added or diversification relative to a specific asset or a concentrated portfolio. It attempts to exploit conditional correlation. I could say that a hedge fund could be a macro diversifier or a micro diversifier. The micro diversifier or complement is a alternative that acts like a partial hedge for specific asset or pool of assets. The macro diversifier's benefit will always be in the context of what happens to overall portfolio's return to risk and not how it will interact with specific asset or situation. 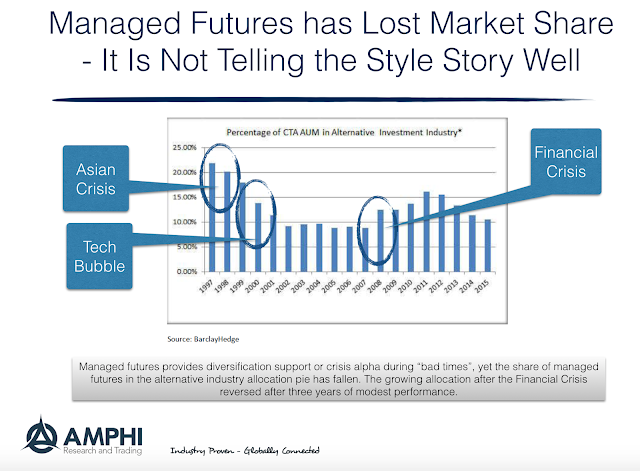 Campbell looked at the difference in hedge fund styles in the context of managed futures. Some managers who have high crisis alpha will be a good micro hedge or complement against an equity portfolio while a diversifier may not have high crisis alpha but will have strong overall portfolio benefit. 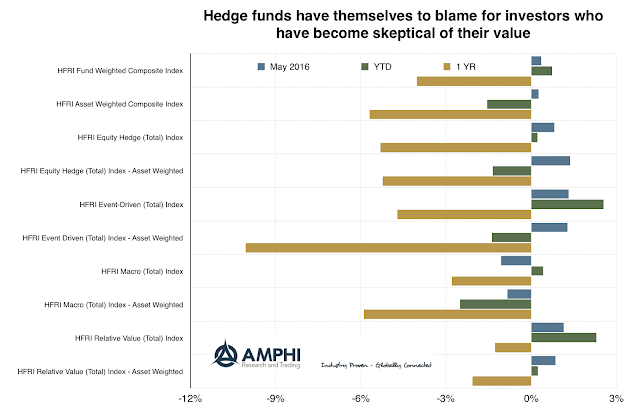 This is an interesting approach to thinking about hedge fund although there could be mental accounting issue with trying to match hedge funds with specific assets within the portfolio. The HP investment model described is very different from the endowment model that has been promulgated by Yale. In contrast to that model, the HP framework places more emphasis on a dynamic approach that changes with market conditions. They call this risk awareness approach. It will also place more emphasis on staying liquid so as to be able to adjust allocations if there is a crisis. The HP approach will place more emphasis on diversification of risks and return sources through the use of more alternative risk premiums beyond equities. It will all try and protect gains related to its funded status. When I step-back from reading about this approach two words come to mind - global macro. This sounds like a big global macro fund that will dynamically adjust exposures based on market conditions and risk premiums. Stay liquid in order to be nimble in the face of potential crises and don't follow a classic 60/40 allocation. Allow for different risks through active diversification. 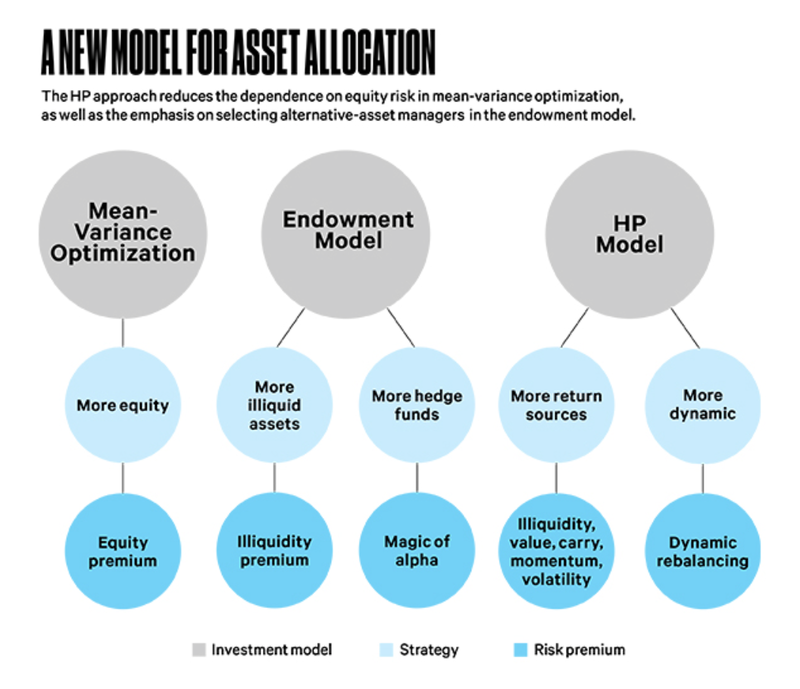 In some sense, everyone can take a portion of their portfolio and allocate to global macro and in essence get a percentage allocation to the HP model. Now, the actual approach is much more complex than that but this would be the basic idea. Take active bets to generate positive convexity as an alternative to illiquid private equity investments or diversified stock holding. Investors love certain shapes in the return distribution. There is a preference for mean and skew, the first and third moments of the return distribution. They hate volatility and kurtosis, the even or second and fourth moments. Positive skew will give you more probability of an upside gain. Kurtosis is disliked because there is a high probability of returns in the tails of the distribution. It represents surprise risk. It is relatively easy for a manager to generate more or less volatility. You can add leverage. Skew is much more complicated. A manager would like to tell you that his activities of trading generates positive skew or a lager right tail. For example, skew could be created by the manager who hangs onto winner and sells losers. Managers can create skew through the use of stop-loss rules to cut negative tails. This is a good story. Similarly, skew can be created by the instruments bought. A non-normal distribution can be generated through buying and selling options around a position. The non-linear pay-off will create skew in the return pay-off. Finally skew can be created by changing volatility to generate a mixed distribution. This could be caused by adding volatility when returns are expected to be good or changing volatility based on some other criteria. If you read about the causes of return skew, you will learn deviations from a normal distribution can be generated from a combination of mixed distributions. If a return series sample mixes periods of high and low volatility, you may get a non-normal distribution with skew. This could be caused by skill of learning when to turn on or off volatility, but it could also be random. The skew may not have anything to do with trading skill. Campbell and Co discusses this issue in their new paper, "The Taming of the Skew". The authors focus on the volatility management and skew. They look at three different methods for managing volatility and their impact on skew. The first is constant volatility target management (CRT) which has been a new darling of many managers. Second, is a signal risk target strategy (SRT) which varies with the quality of signals for trends. The third is an equity risk target which focuses on matching volatility with the equity market. Their work shows that the method for managing volatility will have an important impact on skew and the relationship with other markets. The constant volatility approach will not have skew but will have the highest Sharpe ratio for their tests. The equity based volatility adjustment will have positive skew that will be tied to the equity market moves. It will have the highest crisis alpha or negative correlation during "bad times". The signal generated volatility will have the highest skew but the lowest Sharpe ratio. Their analysis addresses some fundamental issues with trend-following. Conventional wisdom that all trend-follower will have skew is not always correct or may be right for the wrong reasons. The paper assumes that skew can be caused by mixed distributions, but the method that creates the mixture will have different implications for skew. The volatility management will matter. When covered interest rate parity breaks down - we have a credit problem! When a textbook example of arbitrage is called for, covered interest rate parity (CIP) is often used as the perfect case. The interest differential between two countries for the same maturity will be equal to the percentage differential between the forward and spot rate. The only reason this would not hold is if there are structural impediments for the flow of capital or transaction costs that will limit the ability of arbitrageurs to make a sure profit. There is a long history of this relationship holding across most countries that do not have explicit capital controls. Nevertheless, there are times when CIP does not hold. Periods of market turmoil especially in the banking system will place limits on the amount of arbitrage that can be done which leads to deviations in CIP. The post-Lehman period saw significant dislocations which was only stopped by the intervention of the Fed through supplying swap lines. Another period of dislocation was during the EU debt crisis as European banks pulled back lending dollar funded lending. The BIS advisor and head of research, Hyun Song Shin has noted that we are in another period of CIP breakdown. See "Global Liquidity and Procyclicality". We take note of this breakdown because this is both a warning sign for the markets and an opportunity for those that want to take advantage of market dislocations. It is also a period of relative calm in the financial markets. His argument for the CIP breakdown is driven by capital flows but is still one associated with limits of arbitrage and a dollar funding shortage. 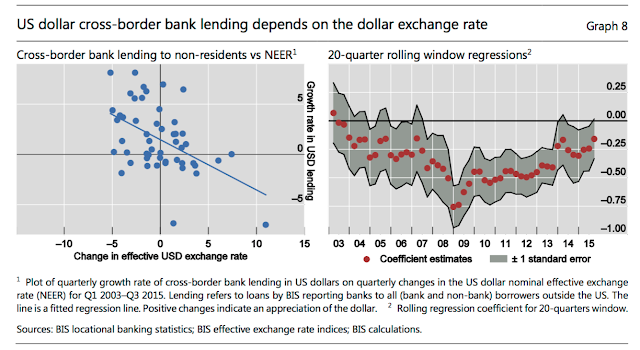 Given bank funding requirements and hedging, a dollar gain will negatively impact the ability of foreign firms who need dollars to fund in dollars. When the dollar rises, there is more credit risk in other parts of the world for sovereigns and corporates who need dollars and have assets dominated in the foreign currency. The currency swap basis will widen. We will see CDS spreads move with the dollar. A currency swap basis disruption is like a seismic tremor. It could be a signal of a potential financial earthquake. 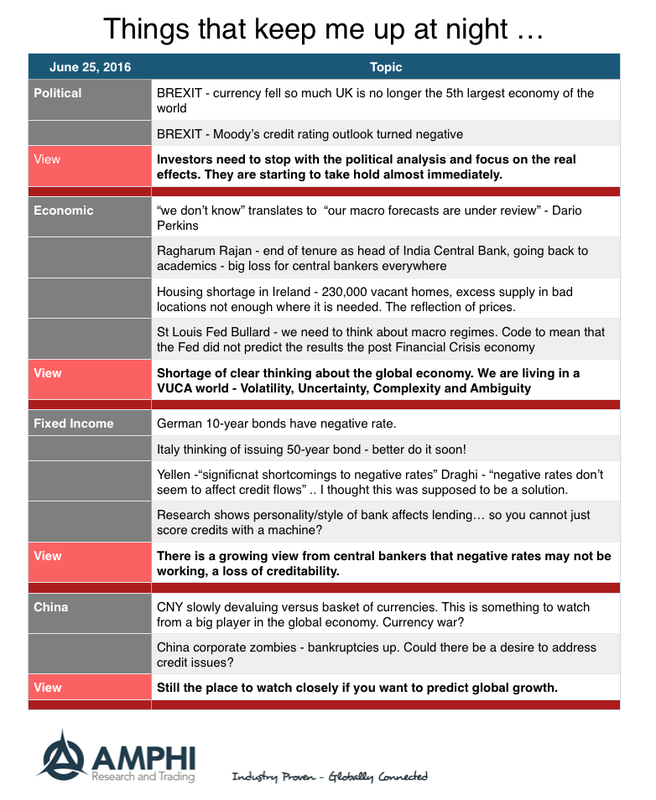 What should investors expect in a negative interest rate world? Hoarding of cash should pick up because the rate of return is an attractive zero percent. Even the big boys are starting to get in on this trade. The evidence of large bills as a percent of cash in circulation is mixed with respect to this question, but investors big and small are thinking about how to hold more cash. BREXIT is not legally binding, so a exit vote may not mean anything if parliament decides not to act on the vote. Nothing will be resolved, but there will be more uncertainty. GDP may be revised down for the last ten years and future does not look so bright. No wonder rates are so low. Flood of speculative money in commodities. This ay not be like the super-cycle period, but there is more interest in these markets. The authors tackle a simple question. Do managers get paid to be different? 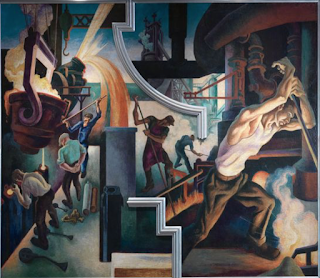 Is distinctiveness associated with skill? They develop a Strategic Distinctiveness Index (SDI) which looks at the return difference relative to some peer measure. It is in the form of a distance function as measure by the lack of correlation to a group. The peer group measure is the crux of the issue. If returns dispersion is caused by misclassification, then there really is not skill with distinctiveness. The authors look at peer classification as reported by a hedge fund service, cluster analysis, and factor analysis. They also adjust returns for potential manipulation. The results, as measure by the amount of distinctiveness versus managers who are least distinct and closest to the peer group, are all the same. 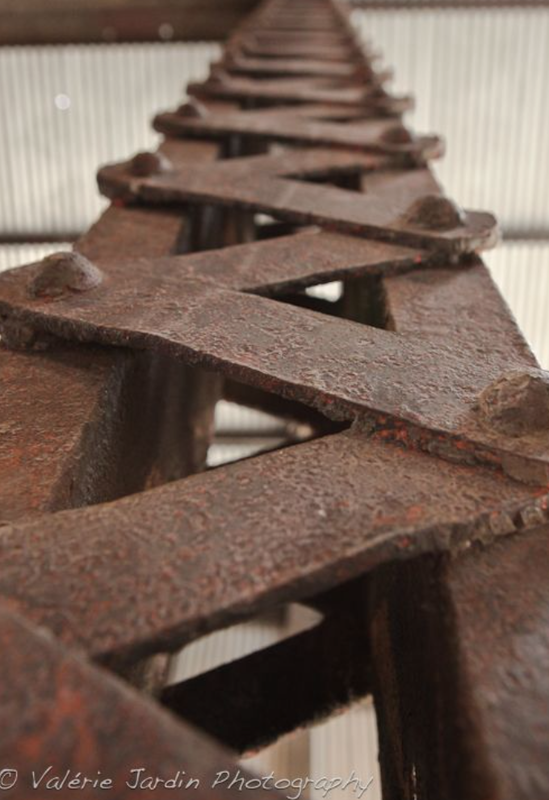 There is value with distinctiveness and this value persists through time . Those who march to a different drummer do better. One could argue that if you are distinct and do poorly you will close up shop. A large survivorship bias may exist, but this work controls for that effect and gets the same answer. This managers that show distinctiveness, (greater active shares or hedging of their betas exposures) perform better. This distinctiveness is associated with smaller and younger managers who are more incentive fee based. Managers who get larger are less distinct. The newer managers have to make a splash and show their skill. Those managers with less skill hug their peers. If you think you have skill, express yourself. For investors, look for the iconoclast. "When the facts change, I change my mind. What do you do, sir?" - Wrongly attributed to Keynes but some have said it sounds like him. This quote is the best we can say about why the Fed's dot-plot change so often. The dot-plot is what the Fed is thinking at the time the plot was generated, but their usefulness as a guide for what the Fed plans or expects to do in the future can change radically in a matter of just three months. We cannot forget that these are not the musing of private economists but of the policy-makers who may vote on the level of rates. The dots represent their views of where rate should or could be over the next few years. The 2018 forecast has fallen by 75 bps. The 2016 median forecast may be the same, but the mass of the distribution has fallen considerably. With inflation expectations lower, unemployment below 5%, growth about what is expected relative to March, the driver for change was the bad non-farm payroll report. One report and the plot curve has shifted down. There is no long-term guidance with these numbers. They change with fluctuations within a quarter. Is that the intent of forward guidance? I cannot belief that this is the Fed's intent. If anyone questions the quality of this guidance, they will be referred to the Keynes quote. A good non-answer on guidance. This plot volatility impacts the Fed's creditability both in the short and long-run. An operational due diligence conference panel - What would I ask them? I got an email inviting me to an operational and governance due diligence panel of experts up in Toronto. I will not be able to attend and hear their comments, but I would have liked to ask some questions that have been perplexing me about how to measure the success of due diligence. Due diligence can be digitized as an either/or question. There are a set of rules or a standard and a firm either meets those minimums or not. The due diligence committee can veto any manager do does not meet a set criteria. More likely, there is a continuum of due diligence quality. Under this environment, the due diligence question is more complex. This complexity can apply even if there is a minimum standard. Some firms are just better than others with respect to operational due diligence and governance. 1. Why do hedge funds close? a. What percentage of closures is based on operational issues versus performance? Everyone talks about survivorship bias, but there is not much known about the failures. This is what due diligence is supposed to eliminate, the failures. If an emerging manager is undercapitalized, it needs performance to improve operational issues. If there is no performance, the operation issues are never solved and the firm never passes due diligence. Similarly, better performing managers can gain capital to improve the business and gather more assets. If this story is correct, then the key issue is performance and the capitalization of the hedge fund. Many operational issues can be solved with good performance. 2. 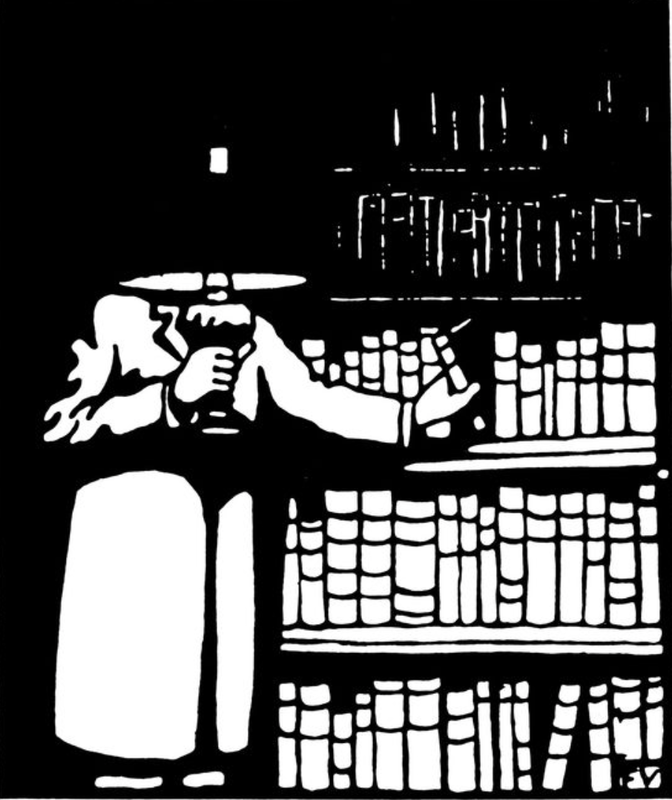 How do you know whether due diligence is doing a good job? a. How do you measure type I and type II errors for due diligence? 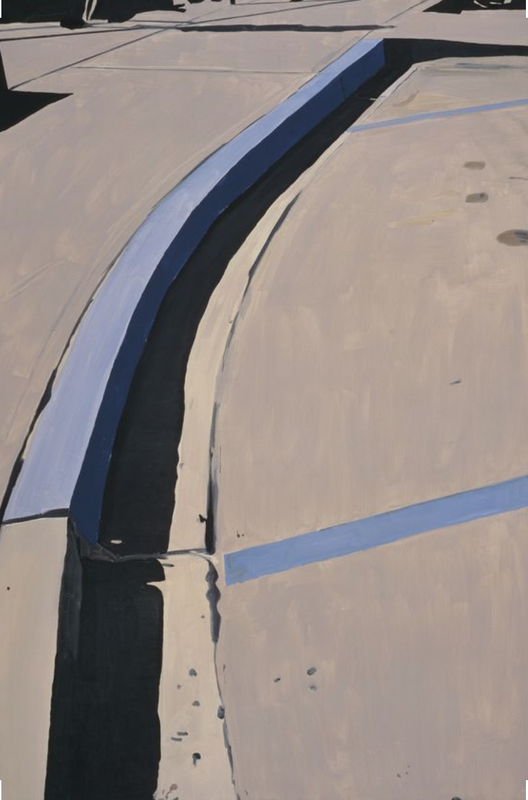 A firm can focus only on large and established firms and never have a due diligence failure. Would that focus on established firms be a successful due diligence process? How do firms measure false positives and false negatives with respect to due diligence? My guess is that most firms do not conduct deep reviews based on some statistical measure. 3. Is the impact of poor operational due diligence measurable on performance? Clearly, if the firm fails, it will have a measurable impact on performance, but most firm failures occur over time and can be seen. What is more likely is that a firm potentially has inadequate staffing or systems and this leads to lower performance. Can this be measured? For example, what is the value of a third party risk management system on performance? 4. 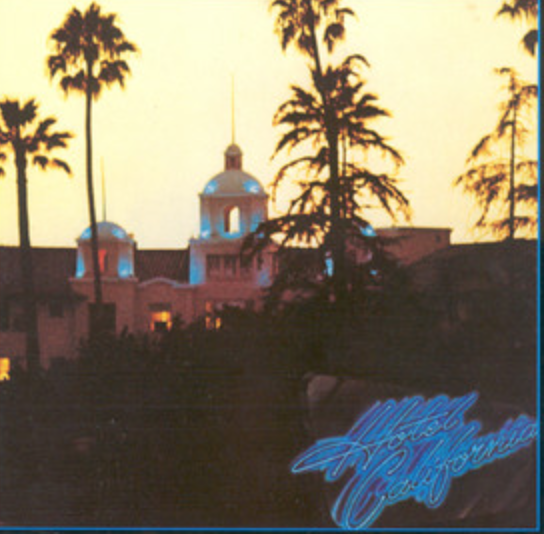 What has been your greatest due diligence failure? Should a firm take pride in never having a due diligence failure or does that just mean that the firm is too cautious? The type of failure by a due diligence team is important. Was the failure caused by a change in behavior or was it from something that was missed in the due diligence process? Was it a known risk that was taken or was it a complete surprise? 5. Does size cure all problems? Quantitative credit analysis focuses on size. Big firms do not fail as often. Their failure will get more headlines but the likelihood is less. Can a firm save time and effort by just looking at big firms and avoid all new managers. 6. Is transparency the only relevant factor? If a firm will not share information, is it ever a good credit risk? A first pass for due diligence can be made easy. If they don't answer questions or share all information, pass. This is always an issue with large successful managers who do not want to give full transparency? Secrecy is important but if the manager does not trust the client to keep confidential information secret, then it is the beginning of a bad relationship. Similarly, is there such a thing as too much transparency? 7. How much added return do you need to overlook a governance and operational issue? There may not exist a perfect firm with respect to operational due diligence. Many firms could improve, so there has to be some added value from firms that are rated lower on some due diligence scale. 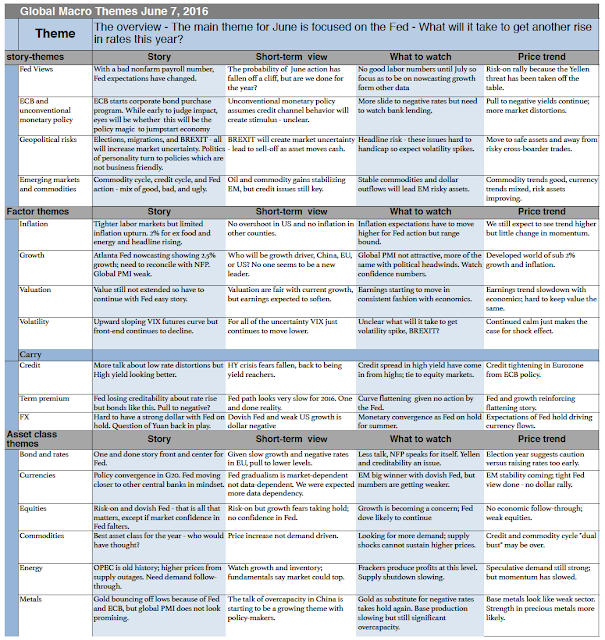 How much return do you need to move down the due diligence scale? To put this more concretely, large firms will likely have a better due diligence record. Smaller firms will be weaker. What extra performance is necessary to switch from the larger firm? "Depends" is an answer, but not a good one. My guess is that the panel will not be able to answer these questions to the satisfaction of the audience. There is no clear solutions to these complex issues. 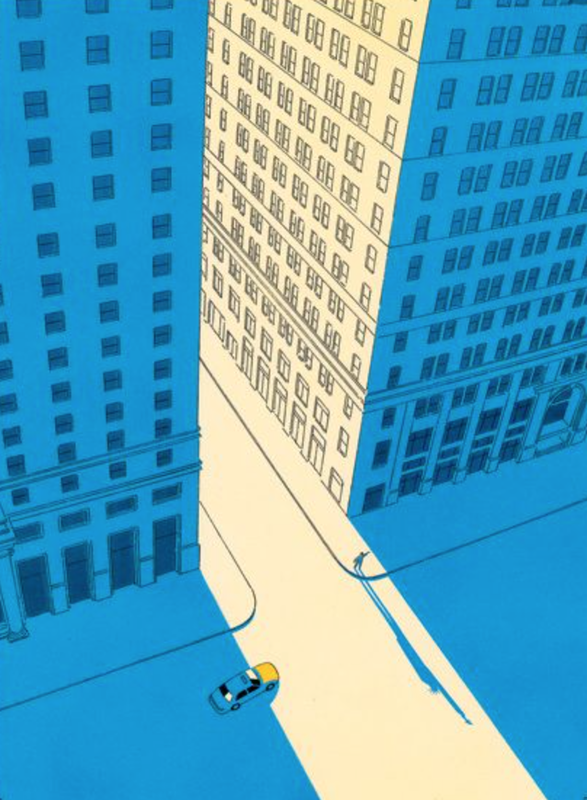 Firms have tried to make due diligence very structured and that has been helpful for the hedge fund industry, but as we have gotten better at doing this analysis we have uncovered bigger questions on the meaning of risk and how it can be measured. The number one issue for any hedge fund investor is measuring manager skill. Everyone has heard that past performance is not indicative of future success, but what can you learn from the past that will help measure future skill? The data are mixed with skin still being elusive. A new research paper, however, has some useful insight. (See "Only Winners in Tough Times Repeat: Hedge Fund Performance Persistence Over Different Market Conditions" by Sun, Wang, and Zheng.) Instead of looking at all of the data, the authors conduct conditional tests based on up and down return periods. I am not a great fan of their measure of down markets, but I accept it as a measure that can allow us to review a lot cross-sectional information. 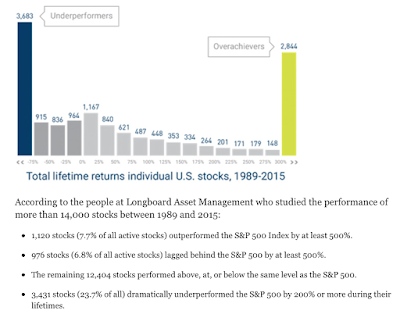 Dividing the market into these up and down returns periods by hedge fund styles, the researchers find that managers who do well when everyone in their peer group is doing poorly is a strong gauge of future returns. Call this the "when the going gets tough, the tough get going" measure. It works. The persistence of this conditional information can last up to three years. It is strong across all hedge fund styles and exists ben when returns are filtered through factor models. This conditional result makes intuitive sense. We have seen other research results suggests that skilled are real good market timers who avoid market downturns. When hedge fund returns are good there could be a fair number lucky managers because the environment is good for making money. When the hedge fund environment is poor, skill can be truly assessed or measured. The best managers can make money despite the poor environment. In fact, this is when they thrive. Show me a manager that can beat his peers during rough performance periods and I will show you a manager that I would want in my portfolio. Pension funds are underfunded and need some investment magic to solve their problem. The problem is very simple. Pension funds could go out and buy more risky assets to generate higher returns but that will only come at the expense of higher risks. If they are wrong, the underfunding problem only get worse. Cambridge Associates in their latest research note "Hedge Fund-ing the Pension Deficit" believes there is a better alternative. Add hedge funds as a low risk alternative that can generate non-beta returns. In a perfect world, hedge funds will have lower correlation with the stock market and the ability to generate uncorrelated return through alpha. There is nothing new with their analysis but it highlights one of the key roles that hedge funds can play in a portfolio. For a pension fund, the story is very straight-forward. For either the Tech Bubble or the Financial Crisis, the funding gap was reduced through holding 20% in hedge funds. From their numbers, there is a 3.5% protection of funded status per 10% allocation in hedge funds during these two crises. 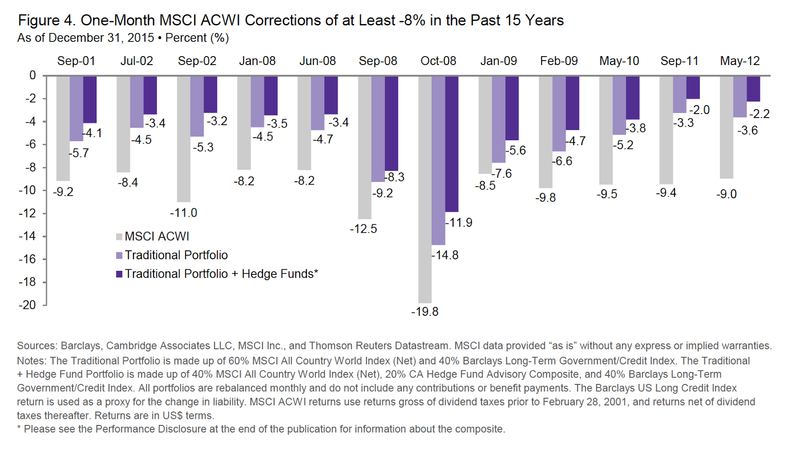 If there is a market correction, a hedge fund allocation will always provide some drawdown protection. This should be be expected from diversification, but what may be a surprise is how well it does versus a traditional portfolio. A 20% allocation, which is not too large, will reduce drawdowns on average by 1-2% relative to a traditional portfolio. The funding problem will not be solved with hedge funds. It is not a magic bullet slaying pension problems, but it can help and offer some well-needed protection. The heated discussions on what is the equilibrium real rate of interest may seem of limited interest to short-term traders. It should not be. 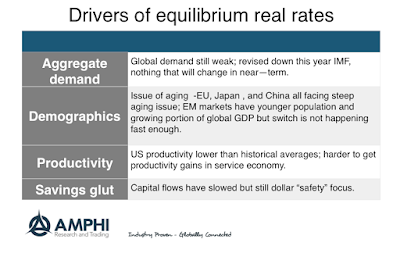 There is significant agreement that the equilibrium rate has fallen because of a number of long-term factors. Most of these drivers will not change in the short-run. Any money manager or investors worried about bond performance in 2016 should rethink their view in light of the long-term equilibrium rate. Demographics, for example, may tell us an interesting story for why real rates have declined over the last few decades but many may think this information may not help over the next 90 days. This view may be misplaced. The equilibrium rate helps set the distribution or span of rates. 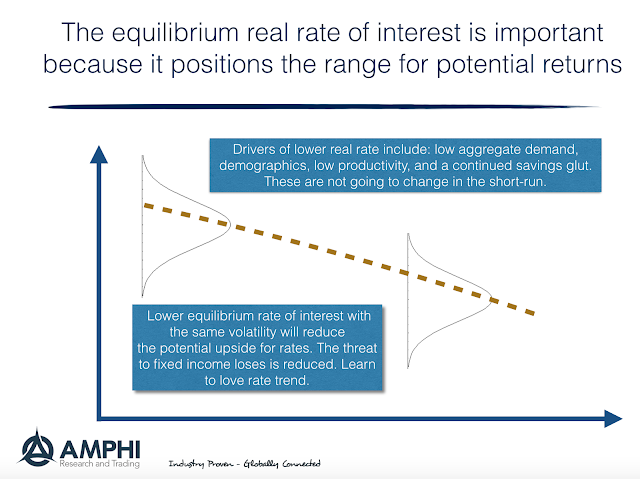 A lower equilibrium rate will bound the potential range regardless of what may happen in the short-run. 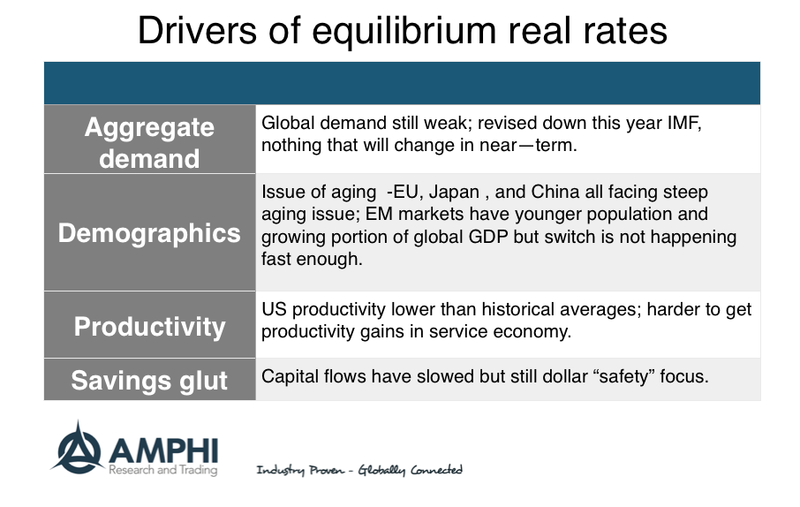 The equilibrium real rate is low and will stay low and investors have to incorporate this view in their thinking. A current fear of a large rate increase is unnecessary. The opportunity is still for lower rates especially given the pressure from the EU and Japan. Forget about volatility as the key risk measure. The focus for most is on drawdown. Of course, high volatility may lead to higher drawdowns, but the number one focus is simple - don't lose principal. Investors don't want downside volatility. Surprisingly, there has not been much talk about tail risk lately. The talk about hedge fund strategies that have better downside protection has also been muted. This needs to change fast. The second greatest vote was for the risk of not meeting return objectives. For pensions or endowments, not hitting your expected returns has real effects. If your discount rate is 8 percent, a return of only 5 percent will have to be made up in the future. For retirees, not generating enough return on savings may determine whether you can retire or whether you will have to continue to work. So the goal for any investment manager is simple. Meet your return objectives and don't lose principal. Clearly, there are few who can do both all of the time, so portfolio construction is critical. There have to be managers who can do either and at different times. There is a need for high performance managers in "good times" and managers who can protect principal in "bad times". The mix has to be the basis for risk management. Others have talked about a "wall of worry". I focus in the things that may keep me up at night. Call it the winds of sentiment but it may have impact on expectations and asset prices. More importantly, it may be the news story that may not mean anything today but may eventually result in future negative event. I found particularly interesting the comments from key investors. Of course, they are talking their books and they have a desire for headlines but their stories have caught my attention. Soros is negative. Gross is bounding a negative debt story. Rich people are hoarding cash. With the Fed likely on hold this month, there is a negative feeling in the air. The managed futures industry tries to use factor descriptions to explain what they do. 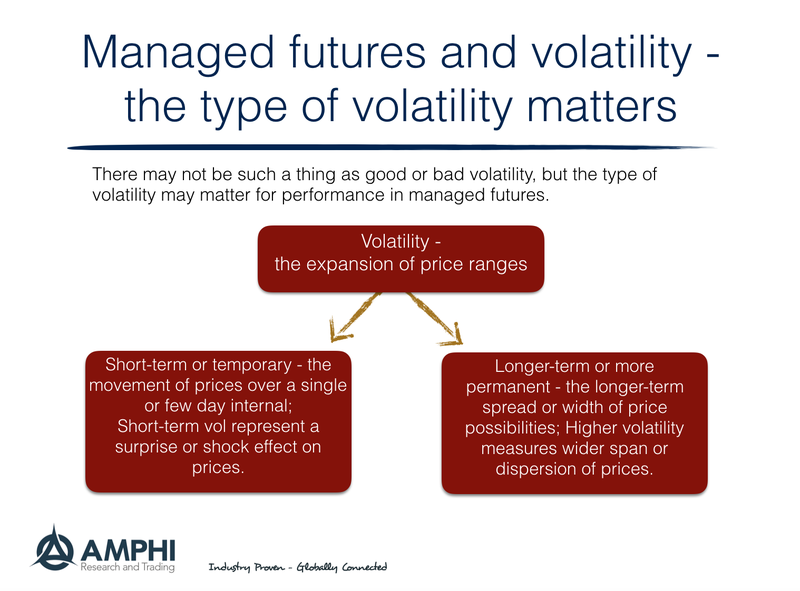 The member or story often used is that managed futures is long volatility. This was the main theme at the CBOE Futures Exchange Volatility seminar in Boston. If the volatility story is to be used, it has to be discussed in the context of timeframe. The managed futures manager is generally, long long-term volatility and short short-term volatility. The type of volatility matters. We don't want to say there is good and bad volatility but there are volatility environments that are better for managed futures. 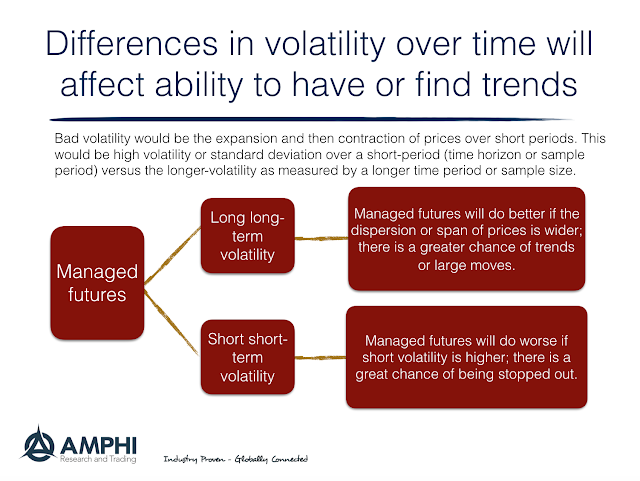 We have looked at this issue in the past with our posting, Managed futures and VIX - beware high daily volatility - embrace high monthly volatility and Managed futures and volatility - a little harder to link than some would think. The better story is that the world is divided into convergent and divergent traders, and trend-followers are divergent or mean-fleeing managers. Higher volatility may be necessary but not sufficient for higher returns. Aggregating hedge fund strategies can be a simple way of cutting through the noise of behavior with a large set of individual strategies. Grouping hedge funds by equity, event-driven, macro, and relative value shows why there is concern about hedge fund investing. Looking at the two aggregate indices from HFR, their composite and asset weighted, shows a dismal last 12 months for hedge funds. Since the disruption with the Chinese stock market, no strategy category has made money. There is no question that the last 12 months have been difficult but buy and hold equity investors as measured by (SPY) would have been up slightly over the last 12 months. Barclays Aggregate (AGG) fixed income investments would have been up around 3% over the same period. Assuming a zero risk-free rate of return and no beta exposure, hedge funds, in aggregate by strategy grouping, have found no net alpha over the last 12 months. 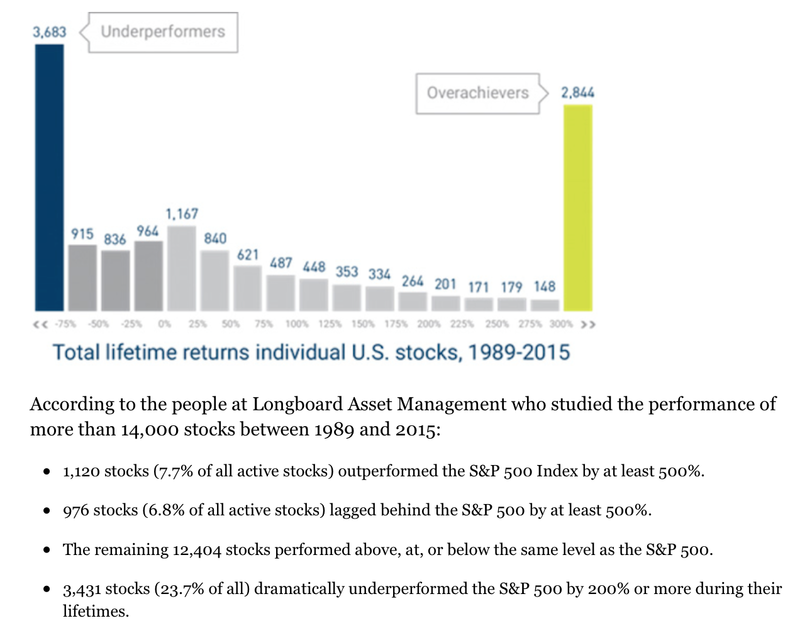 Of course, the dispersion of performance means that there have been winners as well as losers, but simplicity of aggregating information shows that managers are finding limited opportunities. The big question that does not have an easy answer is whether this performance drag is environmental, a period of limited opportunities, or structural, too much money chasing too little alpha. 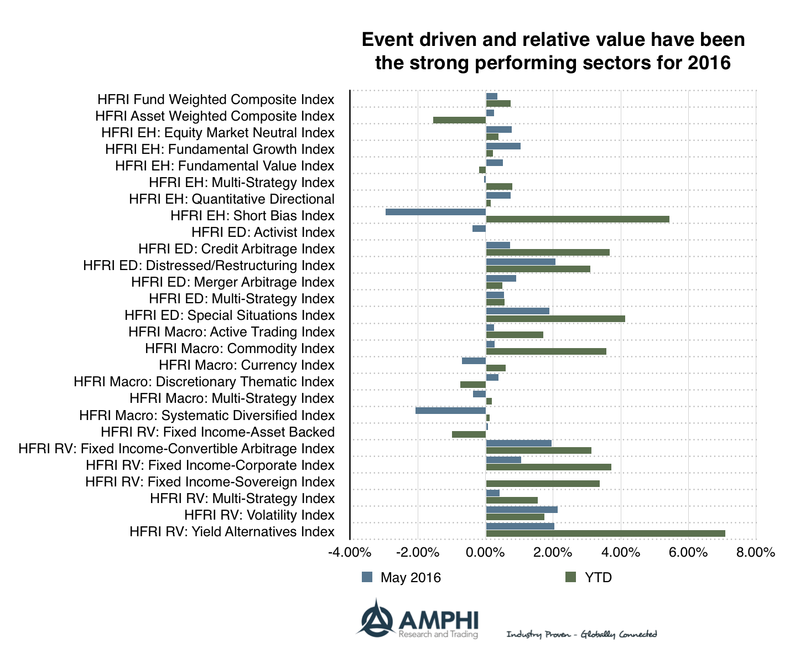 Monthly hedge fund returns show stronger returns in relative value and event driven strategies relative to other strategies. Equity strategies have also been positive for the month with returns consistent with their lower betas. The macro themed strategies were the poor performers as reversals in Japan and changing sentiment concerning the Fed left macro traders wrongly positioned. n a zero risk-free rate environment with compressed risk premiums from too much money chasing certain themes, the performance in alpha strategies for 2016 has been poor but not particularly surprising. 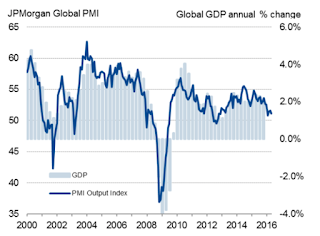 What is disappointing is the inability of macro strategies to consistently find advantage in global markets. An unconventional policy world is an uncertain world which does not give traders room to use old rules of thumb. The monthly themes often stay the same but with ebbs and flows of importance. Again, we are seeing a focus on Fed action. What was on the table a week ago is now off the table, yet whether the Fed is "one and done" still remains to be seen. 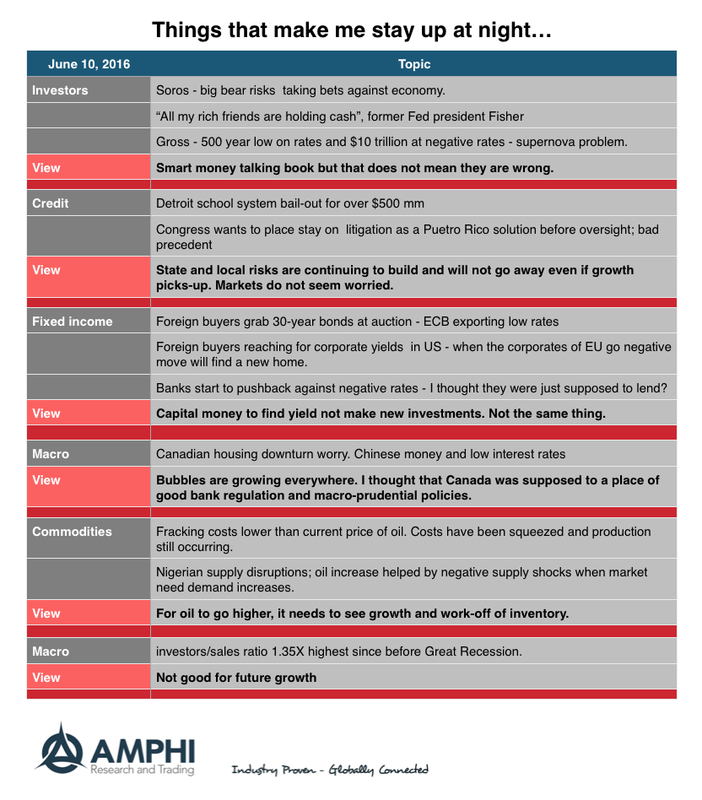 With a pass on June Fed action, asset markets are playing the risk-on story, but the weak global PMI shows that slow economic growth will be a growing theme as we move further into the second half of the year. We generally get nervous with a liquidity-driven market. While we understand investors should not fight the central bank, sustained asset levels have to be driven by earnings from growth not investor driven P/E's. 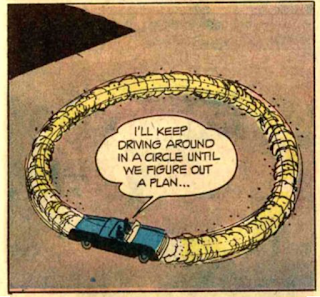 The same logic applies to credit markets. Chasing yield is not a long-term strategy for growth or sustainable investor returns. 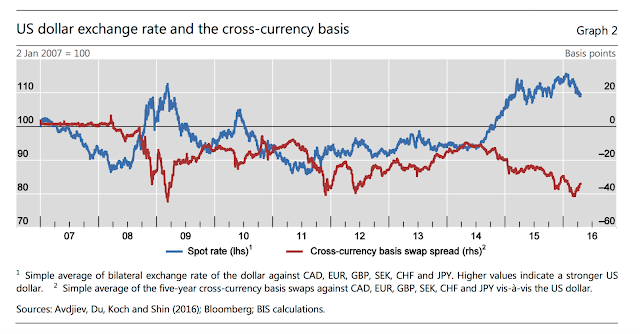 Similarly, currency moves should not be a function of handicapping central bank differences. Nevertheless, investors have to live in the world given to them not the world they would like to have. One of the quiet battles within the alternative industry is between those firms developing multi-strategy funds and fund of funds. For investors, the idea of one stop shopping for your portfolio of alternatives makes sense. The investor can minimize the fixed cost of learning about all the strategies and managers. You pay a fee to have others conduct the due diligence and portfolio construction. As firms get larger and want to diversify their offerings, the multi-strategy approach also makes perfect sense to smooth their revenues. The issue is the the type of structure used to gain access to a portfolio of hedge fund strategies. First, some simple definitions. A fund of funds is a structure where investors pay a management fee to professionals to identify hedge funds that can be bundled into a portfolio. The portfolio managers are outsiders relative to the investment managers. The multi-strategy fund will be a bundle of hedge fund strategies that may be run by different portfolio managers who are employees or partners of the firm that structures or manages the portfolio. A simple table comparing multi-strategy fund and fund of funds can provide details on the differences. 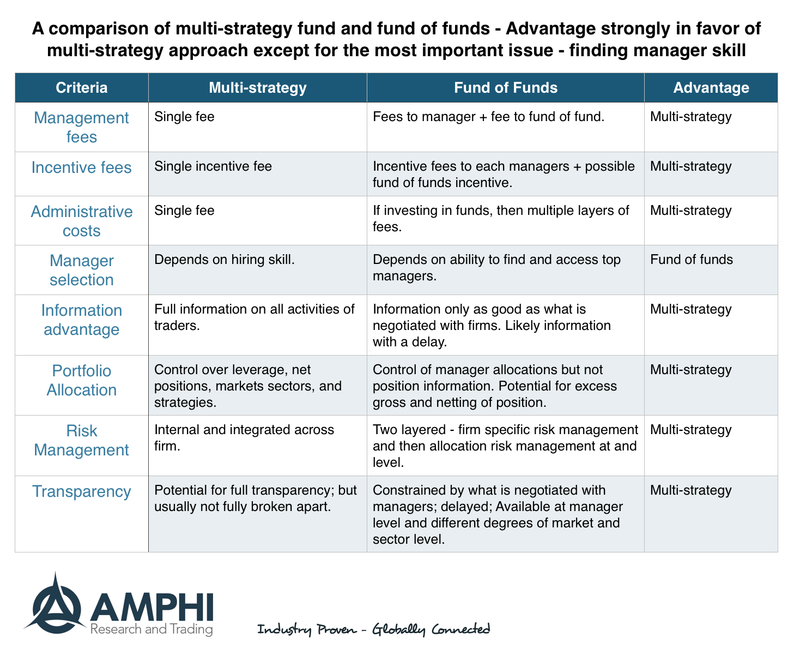 We find that the multi-strategy approach dominates a fund of fund in almost every category except one, manager selection. 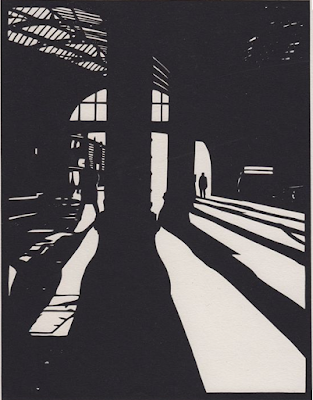 The question of what approach to employ for the outsourcing of building a portfolio rests on a simple question. Can the broad search for the best managers through a fund of funds dominate the cost advantage and portfolio structuring gains from a multi-strategy approach? A fund of funds has to dominate with finding alpha through skill and this skill identification has to offset a host of costs and structuring limitations. If the FoF's skill at finding managers is limited, it has to focus on reducing costs and offering other portfolio alternatives to beat a multi-strategy manager. This may get harder as the number of diversified hedge funds grow. Direct costs are in favor of the multi-strategy approach. First, there is a single fee for the multi-strat approach. The fund of funds has a double layer of fees. The only way this cost advantage is eliminated is if the FoF can negotiate lower fees so the total cost is less that the multi-strat. Nevertheless, the multi-strat will dominate with lower administrative costs versus the FoF's which pay two sets, one for the manager and one for their own fund. This can be minimized through a platform. The multi-strat will dominate because there is one inventive fee as opposed to the FOF which has to pay incentives to individual managers. The performance of one manager may be positive and another negative such that incentives are paid even though the portfolio has no return. There is an information advantage with the multi-strat manager who is able to see all of the trades inside his firm in real time. FoF's could negotiate the amount of information provided but the best it can do is match the multi-strat manager. There is the potential for full transparency of information on the portfolio with the multi-strat manager although this information is not always broken apart for investors. Again, FoF's are only as transparent as the negotiated deals they structure with the managers they pick. 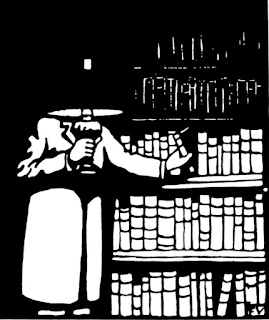 It is possible that bigger more established and/or better managers may not provide the same level of information and transparency to fund of funds. 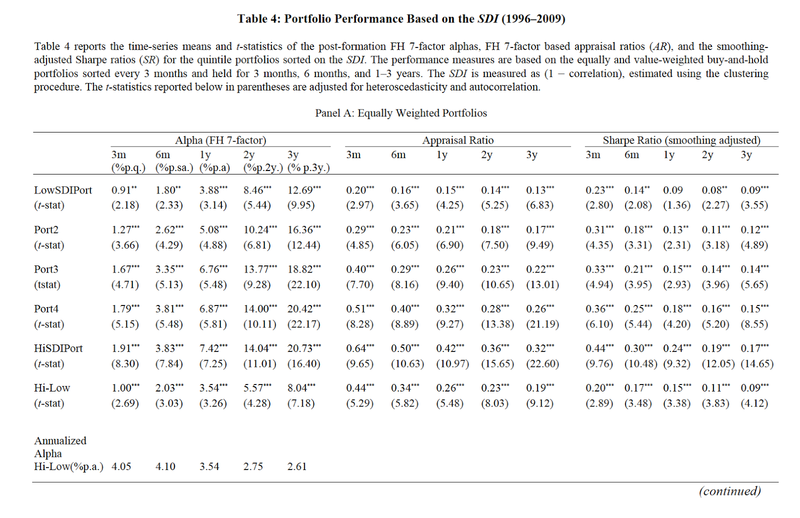 Portfolio allocations for a multi-strat can be done at anytime. Leverage can be fully controlled. Gross and net positions as well as sector and asset class constraints can be managed. FoF's will not have this level of portfolio control for the simple reason that their building block unit is the manager and not the security. Risk management can be controlled for each portfolio manager as well as the entire portfolio by the multi-strat firm. The FoF does not have control of the individual risk taken by the fund chosen. Risk management cannot only be done at the fund level with perhaps some overlay if desired. Why would an investor place money with a fund of funds given these advantages? The answer is simple. The FoF's have been able to use their wider net of contacts to find better managers. The multi-strat has to attract, pay, and manage talent better than the process of searching the entire marketplace. The one factor that is most important favors the FoF. Yet, this advantage is being eroded. As hedge funds diversify and get larger, they will better be able to attract talent. Additionally, as the cost of starting a hedge fund rises, more talent will join larger firms. The skill game will diminish. If the best firms are closed to new investors or less willing to negotiated terms, the advantage of some FoF's will also be eroded. Similarly, as the demand for portfolio management, information, and transparency increases, multi-strat may offer more advantages. On the other hand, the move to customized portfolios may prove to be helpful for FoF's. The development of platforms either inside or outside FoF may also cut costs and erode some of the advantages of multi-strat managers. Given these clear differences, the threshold for the value of each approach may actually be measurable. If the FoF charges more, they may have a good idea of the hurdle on skill that they need to overcome. Similarly, multi-strat managers may know exactly how to compete on services, cost, and skill based on our framework. Given these potential advantages, it is not clear that multi-strat managers will always dominate. There may be conflicts of interest that make it harder to allocate away to internal managers. FoF may be better at manager portfolios, marshaling information, and providing transparency. At the least, we provide a framework for comparison.